HIGH POINT — Two design stars from HGTV, Emily Henderson from the network’s “Secrets from a Stylist” and Taniya Nayak of “House Hunters on Vacation,” will visit the HGTV HOME showroom here on Monday, April 23, during the High Point Market to help Bassett launch the furniture line. The HGTV HOME line of more than 300 pieces in four collections of case goods and upholstery will debut in its own space in the International Home Furnishings Center, C-1003. 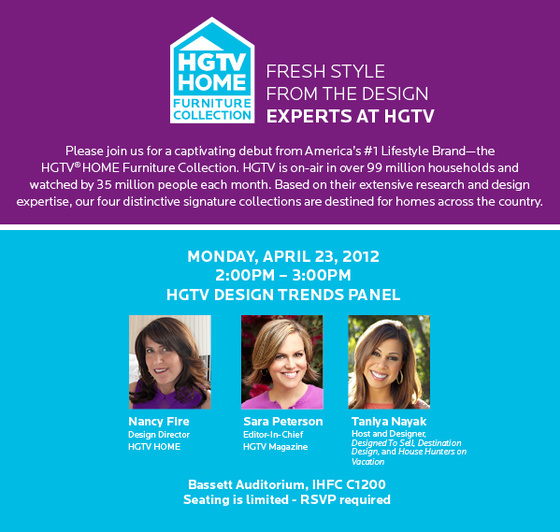 Monday afternoon, Henderson and Nayak will be joined by two other HGTV experts – Sara Peterson, editor in chief of HGTV magazine, and Nancy Fire, HGTV HOME design director – for a Design Trends panel discussion. The event, for media, designers and retailers, is invitation-only. Henderson, the season five champion of “HGTV Design Star,” now hosts a show that has her customizing a room, layer by layer to ultimately help the homeowners discover their personal taste. Nayak is a designer for several HGTV series, and her most recent show explores beautiful homes and resorts around the world with families looking for a place to vacation. As design director, Fire provides insight, support and direction with design, style, trends and product development to help cultivate the HGTV HOME design brand image. She works with licensees and plays a crucial role in project conception, trend analysis and developing the brand’s design direction, then continues to coordinate with licensees on products. Peterson, the former editor of Coastal Living magazine, says that HGTV Magazine aims to give readers inspiring, real-life solutions for what homeowners deal with every day, from painting to pillows to property values. This video about Marvel Comics shows a great new direction the company is going. The artist is using technology to expand his tool set and bring comics into the modern era showing the value of having traditional training and using the best tools to reach the right market. Watch the video here. 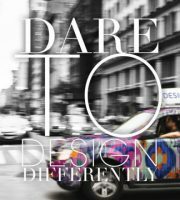 Nancy Fire, Design Director, HGTV Home Brand and Founder of Design Works International, was recently a judge for the designext international student competition organized annually by SURTEX. Find out more in Surtex On the Surface, April 2012. 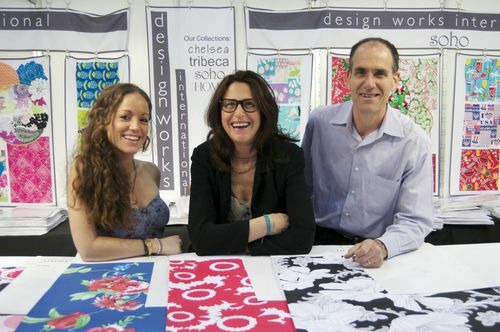 Design Works at Surtex 2011. Center: Nancy Fire. “This year we are focusing on eclectic mixes of patterns,” Nancy Fire, Creative Director of Design Works International, tells Gift & Home Today, “like large scale floral designs paired with geometric accents. Check out the Gift & Home Today article here. And check out Design Works Intl. here.